>Bad news for the pro-death Neocons, Oklahoma has suspended executions following the disastrous failure of the lethal injection of prisoner Clayton D. Lockett. Now the botched attempt to kill Mr. Lockett has reopened the debate about the death penalty in general. "At first, everything seemed to be going normally Tuesday night. Clayton Lockett was declared unconscious 10 minutes after being injected with the first dose of a new, untested three-drug cocktail, according to witness reports. But minutes later, he awoke and began breathing heavily, and, still strapped to the gurney, started writhing and muttering. "In a panic, Oklahoma Department of Corrections officials -- who now dispute that Lockett ever regained consciousness -- lowered the death chamber's blinds to prevent people from seeing the rest. Lockett died of a heart attack 43 minutes after being administered a new and untested drug combination. "Death-penalty opponents are now calling for Oklahoma to suspend all of its executions for the rest of the year to avoid another botched job. Gov. Mary Fallin, a Republican, has so far issued only a 14-day stay for Charles Warner, who was also scheduled to be put to death Tuesday night in the same room as Lockett just two hours later." 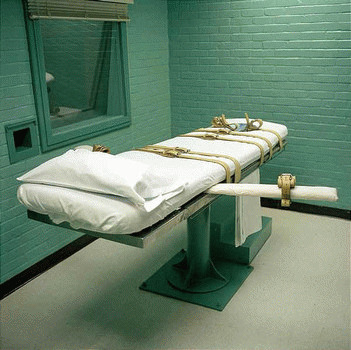 The United States remains the last western nation that still executes its citizens. We hold this esteemed position with Cuba, Iran, Iraq, Syria, and N. Korea and other nations not known for protection of civil liberties and human rights. Still, the death penalty has support in America, largely due to the number of violent crimes that are committed each year (thanks in part to our insane gun laws). The proponents of the death penalty are usually the same crew that waves the Constitution around anytime there is an attempt to pass meaningful gun regulation, citing their 2nd amendment rights to own semi-automatics and other weapons of death. And they certainly disagree with pro-privacy advocates that a woman's right to terminate her pregnancy is protected under the privacy clause; they interpret abortion as violating the "right to life" as described in the 14th amendment. They do pick and choose their positions on death, don't they? Terminating a pregnancy is murder, but killing an actual fully-formed adult human being is perfectly okay. The logic is mystifying. And this being Church Night, it is certainly against the Biblical teaching of Jesus. Perhaps the death penalty would not be as controversial if it had been applied fairly throughout our nation's history, or if there had been 100% certainty that no innocent person had ever been legally killed. But we all know that a considerable number of people have been released from death row because they were exonerated, either by new DNA technology or other means. These people were completely innocent, yet they would've been murdered -- in the name of the people of the executing state -- had the new evidence not been brought forward. This is but one reason anti-death penalty advocates (the REAL pro-life champions) have argued against the death penalty. They also believe the Constitutional protection against cruel and unusual punishment as described in the 8th amendment includes executions. When lethal injection was first introduced, it was supposed to eliminate the moral qualms some may feel about the pain endured while being legally murdered by the state, whether it was by firing squad, hanging, or the electric chair. Lethal injection was just like a mercy killing of a pet -- a humane way to end life, with no suffering. The person just goes to sleep ... right? "Happ's execution lasted 14 minutes before he was pronounced dead -- double the time typically expected when pentobarbital, the executioner's drug of choice for years, was used. He 'remained conscious longer and made more body movements after losing consciousness than other people executed recently by lethal injection,' according to Associated Press reports. "Distilling the amount of pain Happ endured is nearly impossible because the second drug in Florida's three-drug cocktail, vecuronium bromide, acts as a paralytic agent. Its purpose is largely cosmetic, effectively masking how much pain the subject may be enduring. "'We don't even know if the new drug (midazolam) is working or not,' said Richard Dieter, the executive director of the Death Penalty Information Center. 'Everything is a bit of an experiment with a human subject. If this were ordinary medicine, that would not be allowed, but this is the death penalty and that's how it goes.'" "States are running out of the drugs they rely on to carry out death sentences as alternatives for how to secure them quickly diminish. And no one wants to innovate in the execution industry. As the medical community works to distance itself from the science of killing people, states are attempting to forge a difficult road ahead, one fraught with litigation, international tension, and uncertainty. "Florida is just one of several states scrambling to update or refine its capital-punishment protocol amid a sudden shortfall of its lethal injection drugs, resulting in an unprecedented inconsistency in the way inmates are executed in the United States. Even as a steady majority continues supporting the death penalty, the difficulty in obtaining new lethal drugs, associated legal hurdles, and a gaping void of better execution alternatives has left capital punishment in America with an uncertain future." Will the shortage of killer chemicals finally end the death penalty, or will some enterprising soul just find a more creative way to continue the executions?